"Creating a universe one post at a time." Centuries of feuding finally became resolved when the humans united under one central government called the Imperium. The Imperium has experienced obvious success by absorbing other planets into their government which essentially makes humans supreme. This, naturally, has lead to an underground resistance known only as the the Rebellion. The Rebellion feels that forced military servitude and crushing local culture is not necessary to have order and peace in the galaxy. In general, the Imperium views the Rebellion as an annoyance rather than a true threat. What the Imperium citizens do seem to be concerned with is the increasing levels of corruption. Assassination and smuggling are becoming a more commonplace solution to issues that crop up. The black market seems to be thriving. The Imperium has now been in existence for 300 years. Fresh new soldiers are added to their military every day. A new generation of heroes and villains has grown up and are coming into their own. Only time will tell if the Imperium is destined to last or will be overthrown by greed. 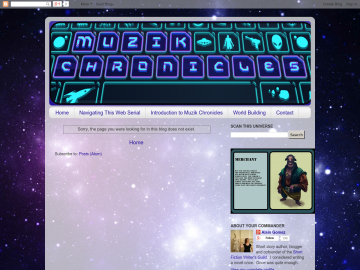 Muzik Chronicles: Serial Science Fiction Stories has not been tagged yet. Help others find Muzik Chronicles: Serial Science Fiction Stories by tagging it! Muzik Chronicles: Serial Science Fiction Stories has not been reviewed yet. Muzik Chronicles: Serial Science Fiction Stories has not been recommended yet.